The period of time during which a contract is in force. 1. The period of time during which a fixed-income security, investment, or agreement is in force. For example, term life insurance lasts only for a certain number of years. The exact number of years is called the term. 2. The period of time during which an individual serves in an office. For example, a member of a board of directors may serve a term of two years. 1. The period during which a bond will remain outstanding. 2. The length of time that a person is to serve in a usually official capacity. For example, a firm's directors may be elected for terms of three years each. A term is the length of time between when a fixed-income security, such as a bond or note, is offered for sale and its maturity date. When the term ends, the issuer repays the par value of the security, often along with the final interest payment. In general, the longer the term, the higher the rate of interest the investment pays, to offset the increased risk of tying up your money for a longer period of time. Term is also the lifespan of a certificate of deposit (CD), called a time deposit. If you hold a CD for the entire term, which may run from six months to five years, you collect the full amount of interest the CD has paid during the term and are free to roll the principal into a new CD or use the money for something else. The life of a loan. The period used to calculate the monthly mortgage payment. The term is usually but not always the same as the maturity, which is the period over which the loan balance must be paid in full. On a seven-year balloon loan, for example, the maturity is seven years but the term in most cases is 30 years. Impact on Monthly Payment: The longer the term, the lower the mortgage payment but the slower the growth of equity. Borrowers who want to make their payments as small as possible select the longest term available. The reduction in payment from lengthening the term, however, becomes less and less effective as the term gets longer. 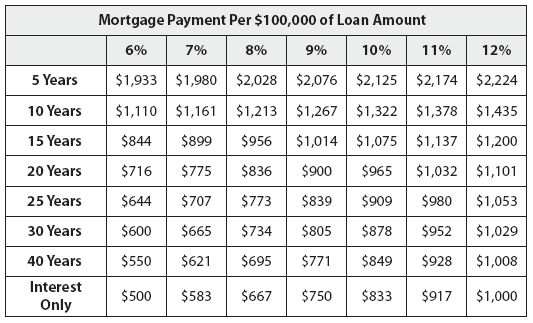 This is illustrated in the table at the top of the next page, which shows the mortgage payment on a $100,000 loan at various interest rates and terms. For example, at 6% extending the term from 10 years to 20 years reduces the payment by $394, but extending it to 30 years and 40 years reduces the payment by only $116 and $50, respectively. The furthest you can possibly go in extending the term is to infinity, which is an interest-only loan—you never repay any part of the loan. On a 6% loan, the monthly interest is $500, only $50 less than the payment at 40 years. Impact on Equity Growth: Borrowers who want to build equity in their home as quickly as possible select the shortest term they can afford. As illustrated in the table in the middle of the next page, the shorter the term, the more rapid the increase in equity. 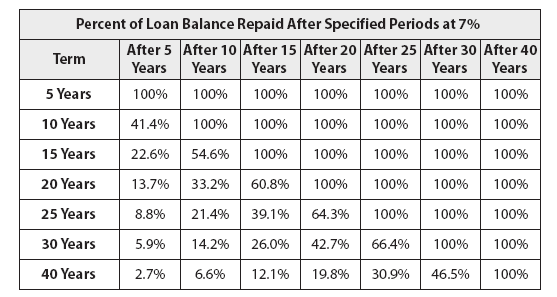 For example, after 10 years the borrower with a 15-year term at 7% has repaid 54.6% of the original balance, whereas the borrower with a 30-year term at the same rate has repaid only 14.2% of the balance. Since 15-year loans usually carry a lower rate than 30-year loans, this understates the difference in the rate of equity buildup. Interest Rate Differences: The two most common terms are 30 years and 15 years. 15-year FRMs typically carry interest rates from .25% to .50% below those on comparable 30-year FRMs. This rate difference strengthens the case for the 15 by reducing the payment advantage of the 30 and increasing the advantage of the 15 in the rate at which equity grows. But note that 10-year terms may not carry rates below 15s and the rates on 20s and 25s are likely to be closer to those on 30s than to those on 15s. Shorter Term Versus Extra Payments: A borrower can always shorten the realized term of a mortgage by making extra payments. For example, a borrower who selects a 15-year loan but wants to pay it off in 10 years can make an extra payment every month to bring the payment to what it would be on a 10. Assuming the interest rate is the same, the outcome is the same. For example, the monthly payment on a $100,000 loan at 6% for 15 years is $843.86. On a 10-year loan at the same rate, it is $1,110.21. If you take the 15-year loan and make an extra payment every month equal to the $266.35 difference, you will pay it off in 10 years. This is hardly surprising, since the sum of $843.86 and $266.35 is $1,110.21, which is the payment on the 10-year loan. The extra payment in effect converts the 15-year loan into a 10-year loan. $1,110.21 is the Scheduled Payment, the amount you are obliged to pay every month. With the 15-year loan, the scheduled payment is only $843.86; the extra payment of $266.35 is optional. Which is better for you depends on whether you attach greater value to discipline or to flexibility. You can't apply this logic to the selection of a 30 versus a 15, however, because the 15 has a lower rate. If you convert a 30 into a 15 by making an extra payment, you will pay more than you would have by selecting a 15 at the outset. Investing Excess Cash Flow on the 30: Most borrowers electing a 30-year term do it because they can't afford the monthly payment on a shorter term. Some elect the 30-year term, however, because they plan to invest the difference in payment. There is nothing wrong with this, provided they understand how much they must earn on other investments to make it a paying strategy. The yield on other investments must exceed the yield on investment in the shorter term, which is generally high. An investment in a shorter-term mortgage is a little different than most other investments. Typically, an investment consists of a lump sum paid out at the beginning and the return is a series of payments received over time. This is the way it is, for example, with an investment in a deposit or bond. ceeds you receive at time of sale because of the smaller loan balance that must be repaid at the end of the period. Let's say you are borrowing $100,000 and choosing between a 30-year fixed-rate mortgage (FRM) at 7.5% and a 15-year FRM at 7.125%. The .375% difference is typical. Monthly payments of principal and interest are $699.22 for the 30-year loan and $905.84 for the 15-year. The difference is $206.62 each month. That's your investment. You expect to stay in your home seven years. At that point, the balance of the 30-year loan will be $91,833 and the balance of the 15-year loan will be $66,137, for a difference of $25,696. That's your return. On an annual basis, it amounts to 10.72%. If the difference in interest rate had been greater than .375%, the return on investment would be higher, and vice versa. The calculation above assumes the interest rate is the only difference between the two loans. But if the down payment you expect to make is less than 20%, you will have to pay for mortgage insurance, and the premiums are higher on the 30-year loan. This increases the return on the 15-year loan considerably. If you anticipate paying 5% down, for example, the higher premium on the 30-year FRM will raise the seven-year return on the 15 from 10.72% to 15.74%. An important feature of this type of investment is that the return is inversely related to how long you expect to have the mortgage. If you remain three years instead of seven, for example, the return on your investment in the case without mortgage insurance rises from 10.72% to 16.21%. If you remain for 15 years, the return falls to 8.60%. That's because you must wait 15 years to realize the return. Calculator 15a on my Web site lets you calculate the return on your own deal. You enter two terms, their interest rates, your anticipated down payment and your expected period in the house. The calculator determines your rate of return. Staying on Schedule When Refinancing: Some borrowers want to refinance while staying on the same amortization schedule. For example, they took out a mortgage seven years ago that has 23 years to run and they want to stay on that schedule, rather than start with a new 30-year schedule. Lenders won't ordinarily make a 23-year loan. The best option, therefore, is to refinance for 30 years, but increase the payment by the exact amount required to amortize over 23—or any other period you wish. Use calculator 2c on my Web site. You tell the calculator when you want the loan to pay off, and it will tell you the extra payment required to do it. The film gets interesting as her son Tommy (Stanislas Crevillen) quickly susses out what his mom is up to, then almost as rapidly comes to terms with his naturally conflicted filial loyalties. If Pegasus comes to terms with any of the potential licensees, work will begin behind the scenes to build a customized online gaming Web site, tailored to each licensee's particular needs. Julia's world is turned around as she comes to terms with this hidden side of her husband's life. Greenwald fortunately avoids idealizing Lily as she comes to terms with the sexual relationship shared by her sister Elna (Jane Adams) and Elna's older colleague Harriet (E.